Not all rodeo clowns dress like one. 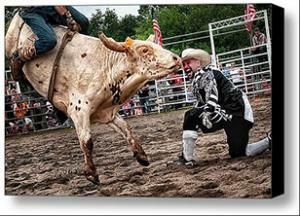 The man kneeling in this photo is on hand to divert the bull's attention after the rider is thrown off. Apparently he is very comfortable with his job.